NERF N-Strike Mega CycloneShock blaster works with Mega Darts only. 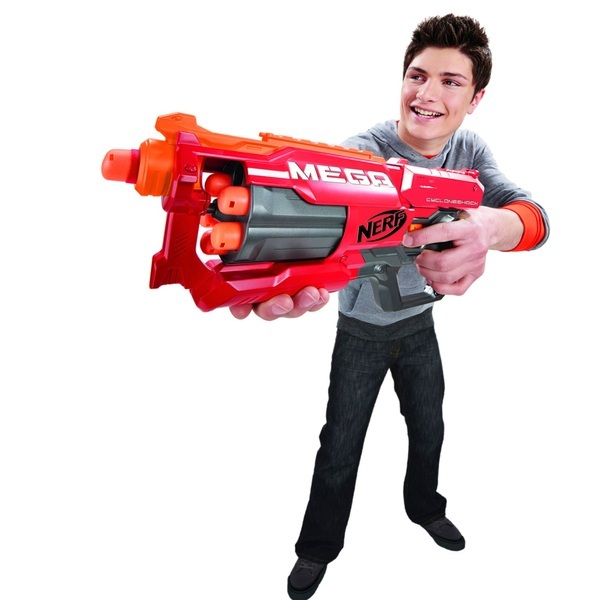 Your battles are about to get a whole lot bigger with NERF N-Strike Mega Cyclone Shock! The Nerf CycloneShock blaster has the same high performance as other Nerf N-Strike Elite blasters, but it features bigger darts engineered to fire farther than ever! The rotating drum lets you fire 6 Mega Darts without reloading! Hit the battlefield – and targets up to 90 feet away - with the rapid- firing Mega power of the CycloneShock blaster!